Easter is one of those holidays I just don’t have any decorations already made for the house. This year, I decided to make my own wreath (tutorial coming next week) and my own Easter egg garland. Even the kids and hubby got into the act! 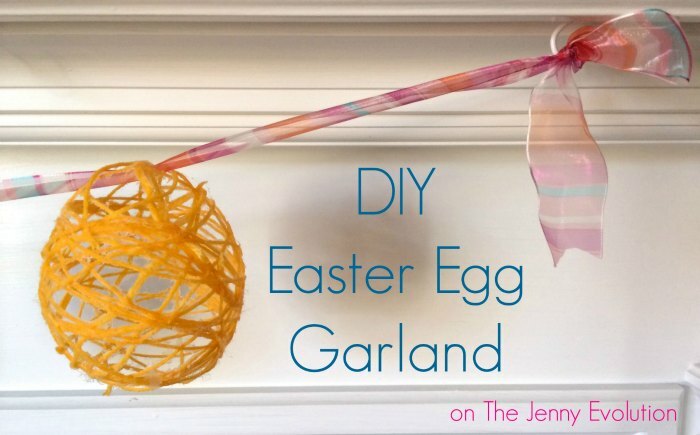 Making your own Easter egg garland is fairly easy, but it is messy. So be prepared! Also, if I had made these eggs smaller, they would have been adorable placed in a bowl or on the mantel rather than turning them into garland. 1. 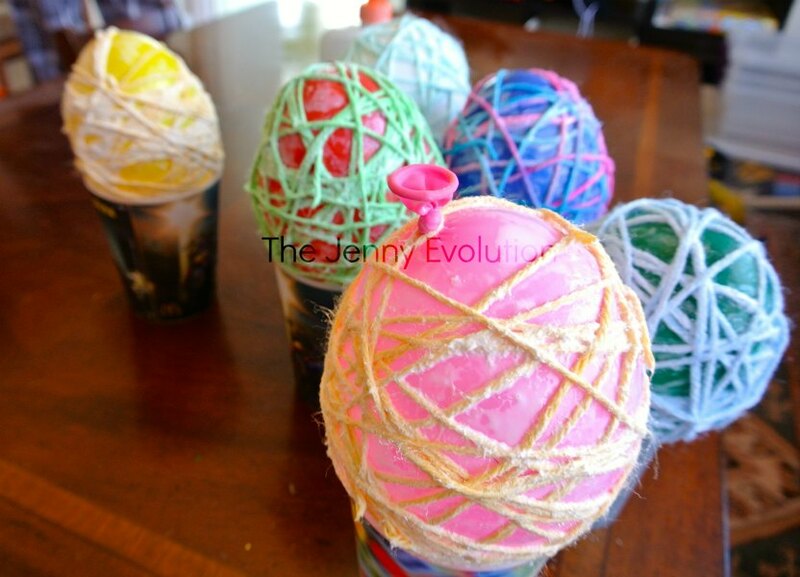 Cut plenty of strands of yarn to wrap and create your egg shell. Your fingers will be covered later and you won’t want to stop and clean your hands to cut more. 2. Fill your shallow dish with a very healthy serving of Elmer’s Glue. 3. Set up your cups nearby so you can easily place the balloons on them once your ready for the eggs to try. 4. Blow up your balloons to the desired size. Water balloons work well but we used regular balloons and they turned out just fine. 1. 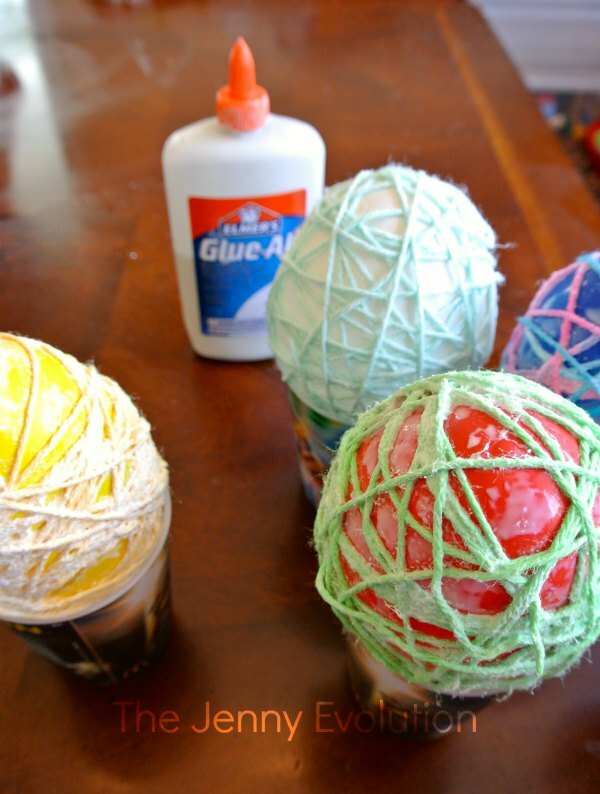 Dip the yarn into the Elmer’s Glue. Be sure to get the yarn covered but not so much that it’s just dripping glue. 2. Wrap the yarn around the balloon, crisscrossing along the way to create a sort of web around the balloon. 3. Make sure to fill in any major holes. Of course you’re going to have holes, but you don’t want any gaping openings. 4. Once you’re satisfied with the wrapping, place the balloon on a cup to dry overnight. 1. In the morning, check your eggs. The bottom portion sitting in the cup may not be fully dry, so you may have to turn them over and wait several more hours for the egg to completely harden. 2. Once the eggs are completely dried, pop the balloons. 3. 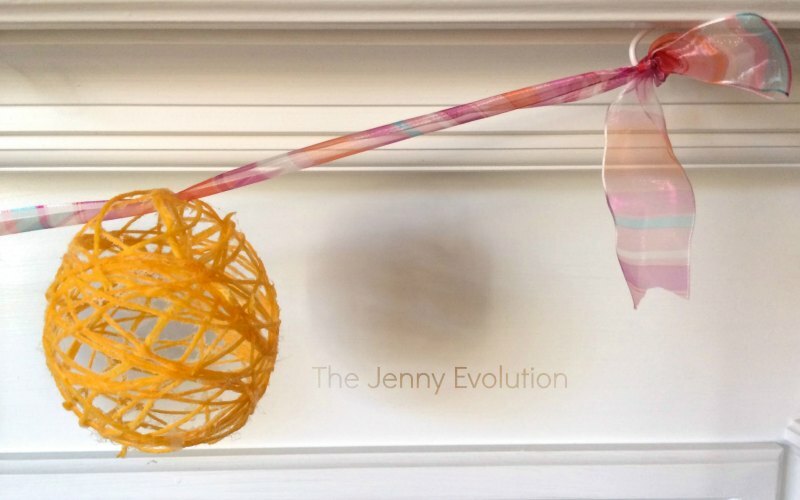 Using your finger or the eraser end of a pencil, dislodge the balloon from the dried yarn. 4. Pull the popped balloon through an opening to remove it from the egg. 5. Thread your ribbon through a top opening in the eggs. 6. Hang your garland. You’re done! Glad you like them! And I yes, you’re right. I would be tempted to make them in other colors to place in a bowl for decoration 🙂 Let me know if you try them out. Always love hearing feedback. I think these could be pretty anytime! Very pretty. Little cost and effort for a decor big bang! Those are so cute. I wish I was creative like that! Actually, this craft wasn’t difficult at all… a bit messy but even my husband was in on the act. Let me know if you get inspired! This is a cool little craft, thank you very much for posting. Have a sweet day! The colors are so beautiful! Nice lighting in your photographs by the way. I have the hardest time taking pictures inside! Thanks — my 5yo and 7yo actually picked out the colors. I took them to the clearance yarn section and told them to choose from there. Ha! Have loads of fun making the eggs… they are messy but fun! And they turned out so beautifully. Honestly, I wasn’t sure how they would turn out. What a beautiful decoration! I love how simple and easy it is, but the results are magnificent! This is so cute. Very simple yet colorful! Thanks for sharing! Yeah! So glad that you like the Easter Egg garland. I’m pretty excited how it turned out. I was a bit nervous (especially with the kids helping) but it was great. These are so cute and seems simple enough to do with a toddler. Such a great idea! Thanks. Let me know if you do the activity and what you think! I always love hearing feedback. Love these Jenny, so dang adorable and look fun to make. My mom did something like this but with big balloons. the liquid mixture had some sugar in it too I think. then when it was all dry, she would cut out an opening and put the candy and grass inside and rick rack around the edges. I never had a desire to do it after seeing all her hard work doing those eggs! Your garlands look great though! Thanks for linking up with the Bloggers Brags Pinterest Party. I have pinned your post to the Bloggers Brags Pinterest Board! This was a crazy messy project but fun. I knew it was a good one when my husband got in on the act. Have fun! Love the colors of the String Eggs! Great project to involve a variety of ages. Thanks for sharing during the Thoughtful Spot Blog Hop! I love these kinds of crafts! Jaime, if I can make them, trust me… anyone can make them. Be sure to drop me a note if you try out the project. What a cute garland – this is a great way to use up leftover yarn from various projects, too. Thanks for stopping by the Thoughful Spot Weekly blog hop! This looks fantastic! Never thought of using Elmer’s glue; I was thinking of using liquid starch. I crochet many projects in crochet thread so I have used the starch to make an angel for my Xmas tree. I have many colors and I thought I would try making eggs this year. Thanks for an alternative to the liquid starch! This is a gorgeous idea for easy Easter decor! So very cute and clever! Such happy colors! I would love for you to stop by my blog and join our Something To Talm About link party each week, Monday- Thursday! I hear you on the weather, I’m just a couple of hours East from Chicagoland, your neighbor State. Aren’t you sick of the cold? Although, spring is showing some signs, Easter weather is still unpredictable. Loving those cute colorful eggs! Thanks for linking up at Thursday Favorite Things. Can’t wait to see what you’ll share next week! Easter weather is always unpredictable. I think that’s why I love to decorate for Easter. At least it feels like spring inside! I love this idea! I like your idea of making them smaller to place in a nice bowl! Dropping in from Crafty and Delicious Party! Hope you have a great weekend! Pinned it! Thanks. The whole family enjoyed getting in on making the garland last year, including my husband and kindergartener! So cute! My kids would love to make these! Thank you for sharing on Show Me Saturday! We had a blast making them… even my hubby got in on the act! Great idea for an Easter kid craft! Thanks for linking up at #PureBlogLove Link Party! Hope to see you Thursday 8.p.m. EST at our next link up. I’m hosting at http://www.homemadefoodjunkie.com. Can’t wait to see more of your ideas! Thanks. My kids had an absolute blast doing this project. And even my husband got in on the act! Oh, Jennifer I love love this! A must do for our upcoming Easter party! Such a great idea! PINNED! I would love for you to share this over at my new link party Making Memories Mondays going on now! Awww thanks! My entire family actually got into the mix of making these — including my husband! It just makes the house feel fresh and happy. I’m ready for SPRING!!! 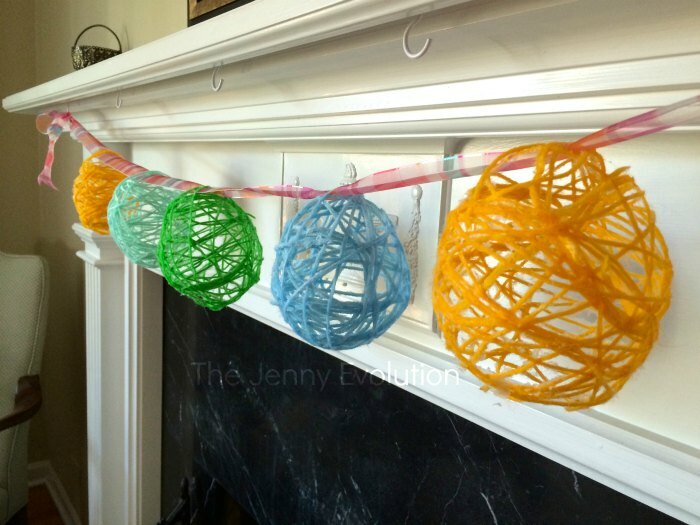 I featured this Easter Egg Garland at this week’s Making Memories Mondays! 🙂 Hope to see you at the party! This looks like a fun project to make with kids and I love the end result! We really enjoyed making the eggs. Even my husband got in on the act. But what I really love is it doesn’t look like a kid’s craft — it’s beautiful under our mantle. This is such a neat idea. I never would have thought to do this. Great job! Our whole family had fun making this garland — including my husband, if you can believe it! Such a cute Easter decor idea! Would love if you shared this at our Yarn Fanatic Linky Party – http://eyeloveknots.blogspot.com/2015/03/yarn-fanatic-linky-party-29.html. Thanks, Brittany. The whole family actually had fun making these… including my husband! What an adorable and simple to make Easter decoration idea. My kids would love making this! Sharing with my followers. 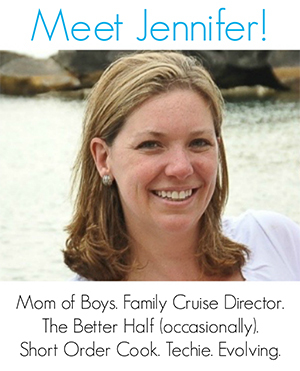 Thanks for linking up with Inspire Me Monday. Have a great weekend!! We had such fun making them and I love the pop of color on our mantel. This is such a cute idea! Thanks so much for linking it up to the Inspiration Galore Project party last week. You are one of my Features tomorrow over at http://www.recreateddesigns.com. Pinned and shared. This garland is really cute! Thanks for linking up with our Merry Monday last week!